Summer News Letter - January 2015. A big Hi to you all for the start of this year 2015, we trust all went well for your Xmas and new-year festivities. So!! What’s happening at Beker’s MCT for this year? The Euro is having a bit of a rest and so has let its guard down, in other words the Euro has devalued, so you folks from NZ, Aussie and USA can benefit from the much lower Euro and receive even better value from our European Tours this May/June 2015. 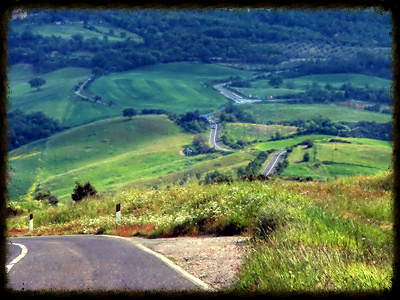 Come this year and experience what all our return tour participants love so much about some of the world’s best riding and the amazing sights of Europe, whilst it is still just so easy too ‘country hop’ in such a relatively small area. We well remember the strict border crossing days and although exciting, the crossings sure could cut into your day’s riding time, especially where we can go into 3 or more countries in just one day! The very old saying of “Just do it now” really applies to Europe more now than in the last 15 years or so. Our “Great Kiwi Alps Tour 2015” is still requiring more numbers to be viable to run as of just now there is still time to contact us if you are interested and we can see if we can get enough tour members gathered up for this wonderful adventure of the German, Austrian, Italian, Swiss and a little of the Slovenian Alps to be a go for 2015. The USA/Sturgis 75th Anniversary Harley-Davidson® tour is gearing up nicely, this is going to be the “Grand-Daddy” of all Rallies/events, never before in the past anywhere in the world has there been such a number of motorcycles gathered in one area as will happen this year in Sturgis S.D. The real plus of this; is that even though there will be bikes and riders for miles it all works safely with extremely high fun zones for those that love to experience it all up close! Some like us just meander and soak up the sights with a cool drink or two. We have managed to have some great rides over the last month, now that the weather is behaving we really hope you all are managing some great riding or whatever you really enjoy doing the most! 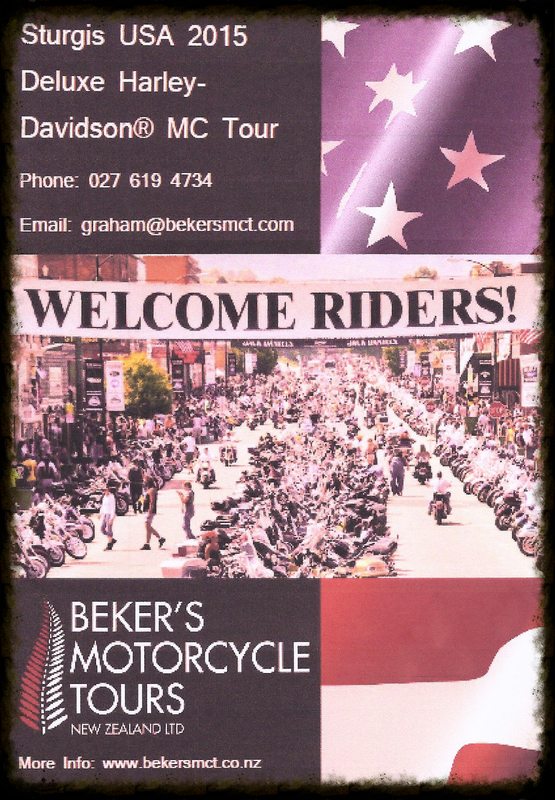 Looking forward to New Zealand’s 1st Harley-Davidson® Premier Event in Queenstown (our hometown) 20/21March, the IRON RUN, this is promising to be a real great gathering of perhaps a couple of thousand or so Harley’s® which should really make the hills come alive to the sound of V-Twin music. 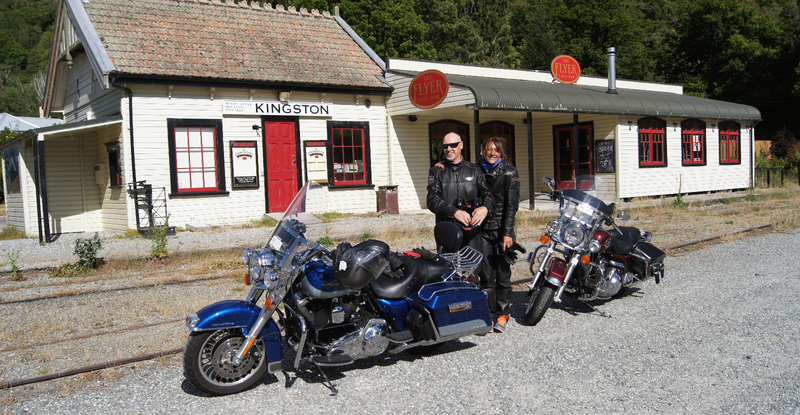 You folk in the Northern hemisphere could start thinking about our New Zealand Authorized Harley® tours that start after our NZ winter from November, or you could still make it down for our “Deep South H-D® Tour 13th---20th March 2015, this one we experience Southern hospitality at its very best. So who’s keen to join the touring scene for 2015? 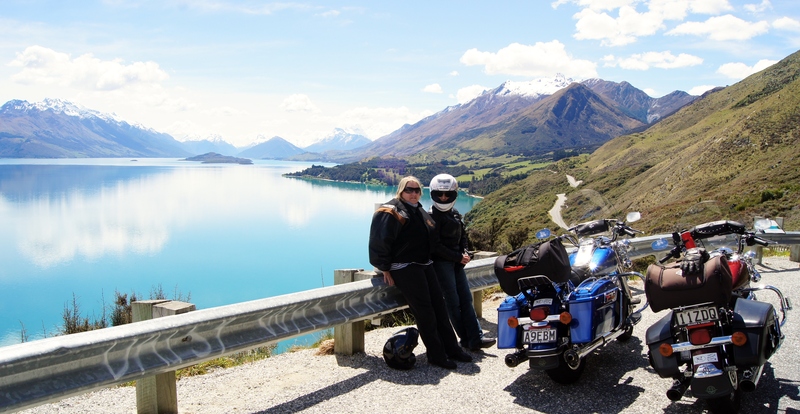 Copyright © 2015 Beker's Motorcycle Tours New Zealand Limited, All rights reserved.